The Miele U1 Dynamic Maverick is an incredibly priced, full-sized Miele upright vacuum. Deeply clean area rugs or carpeting, and then switch seamlessly to smooth floors with this high quality, German-made vacuum. 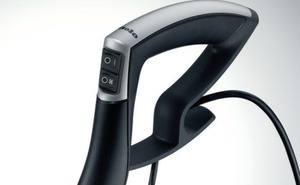 The Miele U1 Dynamic Maverick has replaced Miele’s Award Winning U1 Dynamic Twist. Using Miele’s premium 1200-watt vortex motor, the Miele Maverick will draw up to 140 cubic feet of airflow per minute. Capture dirt that’s hiding deep down on any pile of carpeting, or quickly clean any smooth surface with this industry-leading suction motor. Miele’s automatically adjusting brushroll will ensure the closest and deepest clean on any pile of carpeting. The 12-inch cleaning path will efficiently lift debris and hair away from the pile on the first pass. The brushroll is lined with stiff synthetic bristles, and is spun at 4,800 RPM by an independent motor. This aggressive brushroll will work through carpet fibers, capturing dirt other vacuums would leave behind. A set of 360° castors at the front of the machine and large rubber back wheels allow the Maverick to glide effortlessly on all surfaces. 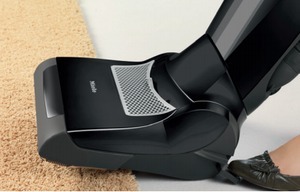 For smooth surface cleaning, you may turn the brushroll off with the flip of a switch on the vacuum’s handle. The Miele Maverick comes loaded with features to help you clean from top to bottom. A unique swivel neck design will allow you to maneuver the vacuum into the tightest of spaces, as well as lie almost completely flat to the floor. With a large 5.4 qt. 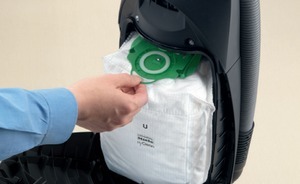 dust bag and an Air Clean filter, the Maverick will trap all the dirt and debris you pick up and even clean the air in your home. For detail cleaning, the Maverick has a 12-foot pull-out extension hose with a lightweight telescopic wand. Three accessory tools, (upholstery tool, dusting brush and crevice nozzle), fit smartly into the back of the vacuum near an ergonomic carrying handle. 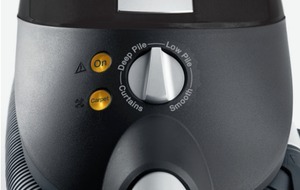 You have full control of your vacuum with the Miele Maverick. Control power to the machine or brushroll with two independent switches on the handle. Dial in just the right amount of suction with a large rotary dial control at fingertip’s length.